NHL goaltenders will be sporting a smaller chest protector this season as the league continues the process of shrinking equipment, following recent size reductions for pads and pants. Connor Hellebuyck recently stopped a puck up high near his collarbone — a shot that, in years past, he might not have thought about twice. In this instance, however, it hurt. "Didn't feel very good," Hellebuyck said. The goalie for the Winnipeg Jets, like all NHL netminders, will be sporting a smaller chest protector this season as the league continues the process of shrinking equipment, following recent size reductions for pads and pants. The aim, like the other streamlined goalie gear, is to boost scoring while at the same time rewarding athletic ability in the crease by eliminating unnecessary padding that wasn't protecting goalies, but instead simply helping them block pucks. In short, a 190-pound goalie and a 240-pound goalie will no longer cut the same figure on the ice. The focus of the league, in conjunction with the NHL Players' Association, on chest protectors has been reducing the size of the shoulders by roughly an inch to make them less boxy and more form-fitting. The same goes for the padding on a goalie's arms. "When you buy a suit, everyone wears different sizes," Whitmore said. "That was our challenge — adding different sizes to encompass all goalies." Getting the new equipment, which is scanned using 3D imaging before being inspected prior to approval, has taken longer than anyone wanted because of delays with manufacturers. But despite grumblings in some goalie circles this summer and into the pre-season, Whitmore said they're close to what will become the "new normal." "We wanted to get it right once and for all," he said. "It was a more complicated piece of equipment than when we introduced the new pants or pads. We can ask companies to make changes, but things didn't move very fast until we created a standard, gave them specifics and asked them to build to it." Whitmore, who played the position for 155 games with four NHL teams in his 15-year pro career, added that despite some hiccups, safety has been top of mind. "There's no expectation that a goalie should have to do his job getting bruised daily," he said. "We're having to work through some deficiencies from a manufacturing side. "I don't want to see guys go on the ice fearful of getting hit with pucks, because that's what they do for a living." Mathieu Schneider, special assistant to NHLPA executive director Donald Fehr, said the personal nature of chest protectors — some goalies had worn their old ones for a decade or more — has been a challenge, and a feeling-out process should be expected. "The irony is each time we've made equipment smaller, it's gotten lighter and goalies have gotten better," said the former NHL defenceman. "It's not like this snuck up on us." Until the recent changes, equipment had been ballooning for nearly two decades. Netminders looked more like football offensive linemen than the skinny-by-comparison goalies of previous generations. "They were huge," recalled Toronto Maple Leafs winger Patrick Marleau, who entered the league in 1997, of the puck stoppers early in his career. "They had the long jerseys so shots would get stuck, they had an extra pad in the five-hole." Whitmore said he's spent countless hours trying to help quell concerns from current goalies about new gear that might not quite fit or rides up at times, potentially leaving a part of the body uncovered. "One guy might think the unit's perfect, another guy might get hit somewhere," Whitmore said. "We've tried to work with each goalie, whether it's a piece added, some extra foam." Leafs netminder Frederik Andersen said he's fine with what's being done, adding that an inch of missing shoulder coverage shouldn't make a difference in terms of results if he's on his game. "It's about being square," Andersen said. "If I'm relying on that extra inch, I'm in trouble already." Like the rest of the goaltending fraternity, his overwhelming concern is safety. "Definitely had it a few times where a shot might have hurt a little bit more than it would have last year," he said. "But I have no problem with the way Kay's been handling it and having a dialogue." Garret Sparks, in a battle for the No. 2 job in Toronto, said he thinks the change could eventually help raise the skill level at the position. "It just pushes me to be better," he said. "I'm open to the challenge as long as everybody's covered." The only thing is, not everybody feels that way. NHL shooters scored more times in 2017-18 than in any season since 2005-06, averaging nearly six goals a game. 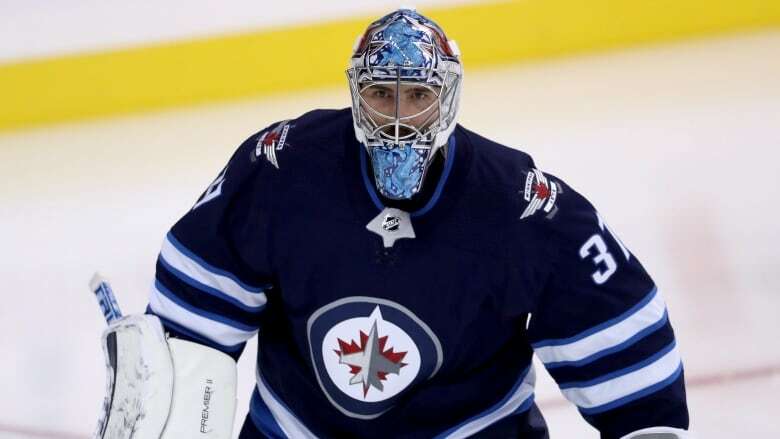 With that in mind, Hellebuyck doesn't see a need to change — for safety or competitive reasons. "I'm not happy about it because it's my job," he said. "And really what they want is me to be worse." But with the entire process in full motion since 2016, Whitmore said recent history gives him confidence the new gear will provide the game an overall benefit. "It makes the job a little more difficult," he said. "We changed other things to make goaltenders more mobile. At first they didn't agree with it, but once they started playing they felt faster, quicker and actually got better. "I don't expect anything different from this once they adapt."